Why aren’t my hydrangeas blooming? My winter kill hydrangeas care tips are here to help! To make a long story short, it’s because of the harsh winter! 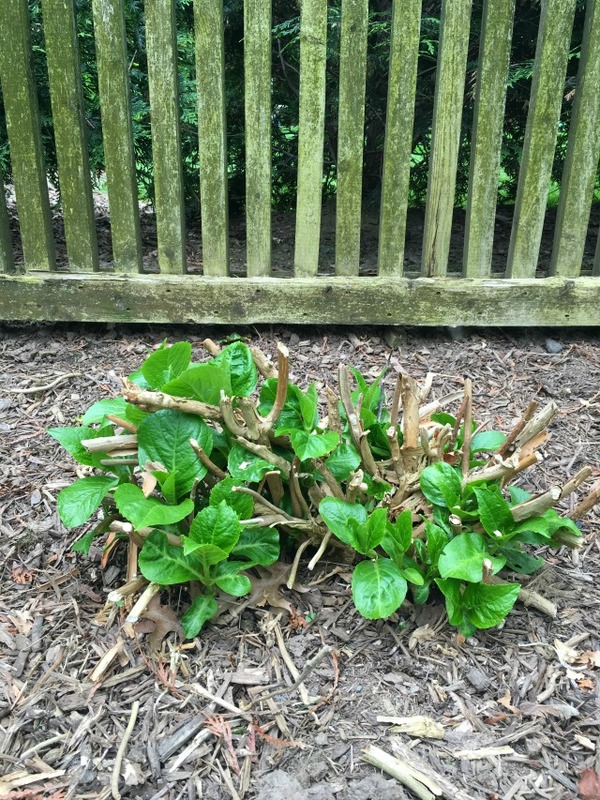 If your hydrangeas are pathetic brown sticks like mine, join me in a moment of silence then read on to see what you can do about it. The back story: After two hydrangea-less summers (thanks to the “pro” that mutilated my hydrangeas one spring (read my When to Prune Hydrangeas so they Bloom post so this doesn’t happen to you), I could feel it in my bones that this was gonna be my year! I cried, I prayed, I may have even created a vision board (picture me frolicking through a valley with armloads of hydrangeas in my arms) to will those blooms into happening. My hopes were dashed when the winter frost wreaked havoc on my sanity and my precious hydrangeas. So now instead of blooms, or even lush green leaves, I am left staring at ugly brown sticks with not a bud in sight. These babies are fighters! Peek deep down into the heart of the sad little hydrangea and you can see it’s Rocky like leaves reaching towards the sun. Not exactly a page out of Better Homes & Gardens, my sticks need an intervention. Green Buds on Brown Canes – DO NOT CUT the brown branches – they are alive and should bloom. Just prune out the canes that are dead (no green buds on them). 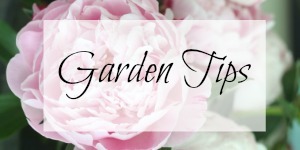 No Green Buds on Brown Canes (buds may even be black) – cut all canes to the base of the plant – making sure to leave the new growth green leaves at the base of the hydrangea. 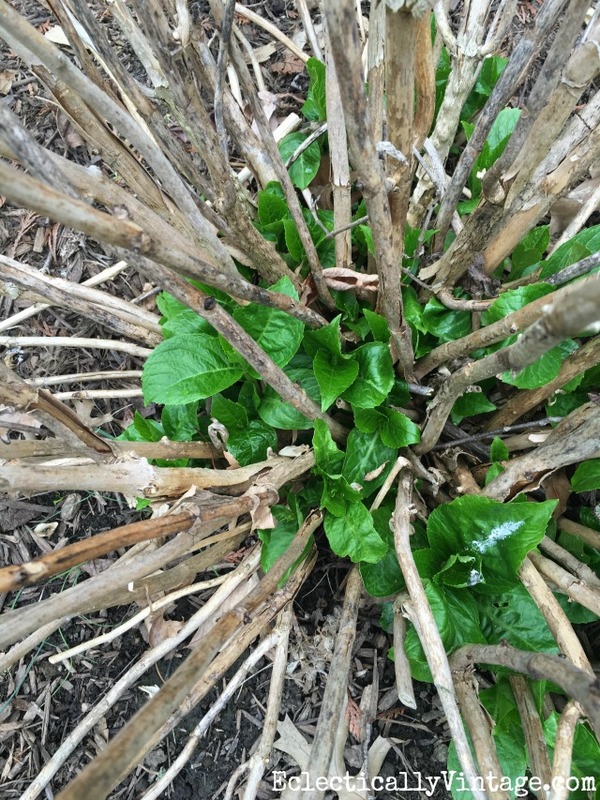 Note: if you don’t have any green buds on the brown canes by mid-May, cut them. What to Expect: Your hydrangeas should grow to at least the same size they were last year. Will they bloom this year? Old wood hydrangeas won’t bloom, new wood/old wood hydrangeas may bloom later in the summer and new wood hydrangeas will bloom as usual. Check out this post to learn the different types of hydrangeas. Note: I swear by (affiliate) this fertilizer and sprinkled it around my hydrangeas to give them an extra boost. Make sure your pruning shears are clean and sharp. I love these pruning shears and this soil acidifier to turn your hydrangeas blue. Seventeen of my hydrangeas were affected – can you feel my pain. The only one happy about this whole debacle is my dog, Sushi. and I’ll never make another vision board again (thanks for nothing Oprah)! and at least I have my peonies to console me. Since this doesn’t affect Limelight Hydrangeas – which I planted last year – read my tips on planting Limelights. 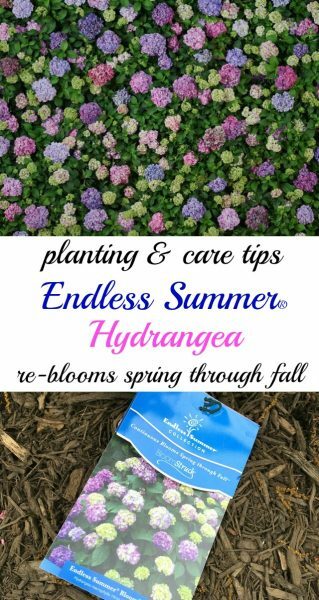 Find out if Endless Summer Hydrangeas are right for you (they re-bloom from spring through fall)! 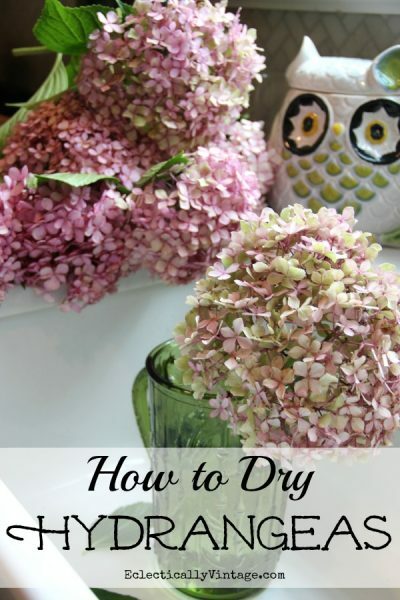 If you are lucky enough to get hydrangeas this year, make them last with my simple hydrangea drying tips. I know exactly what you are going through here in Connecticut. My hydrangeas as well as those of all of my gardening buddies look just like yours – so very sad! Mine line both sides of my long driveway and always put on an amazing show of bloom, but not this year – oh well. I also lost my magnolia and lilac buds. The paniculata hydrangeas weren’t affected, so at least I will have their blooms. I feel your pain Liz! Shame about the magnolias and lilacs! It’s such a shame Liz! I can imagine how gorgeous they look lining your driveway! The former owners of our rental mowed everything to the ground. When we looked at the house, the weeds were knee high but I could spy some perennials. Last year I found the tiny remains of the hydrangea bush. This year it’s a little bigger. I won’t expect blooms for 5 years but we’ll get there…as long as the renters don’t mow it down! You need to chain yourself to the hydrangeas when you see the renters coming! I made metal cages from 3/8″ rebar to go over some small trees to protect them from being trampled. In the months of frost possibilities I wrapped them with strings of white lights. The lights put off just enough heat to protect the plants from frost damage. The lights are not LED. We decided we like the lights and left them year round. I hang small hummingbird feeders or decorative hanging art at the top of the U of cages. Great idea to use lights for frost damage! I’d love to see a pic of this idea! Melody, You should post a picture, I would LOVE to see that. Kelly, as for the winter kill-I got it too here in Wisconsin. ***sigh*** But, They are coming along nicely now and are LOADED with gorgeous blue blooms. I only got maybe 6 blooms for the first time ever in Southern Wisconsin! I did this with my foxgloves. Used tomatoe dages but uoside down. It supports blooms better . Yes those are a great alternative support! All of us in the East who were hit with those mean Spring frosts have sad hydrangeas. My go to garden center recommended cutting back with the same guide lines you mentioned. He also said to spread/work in some Plant Tone to help them get back on their feet. Crazy Mother Nature, lilacs, irises, peonies have been crazy beautiful in New Jersey this spring. We always have Limelight and next year to look forward to. 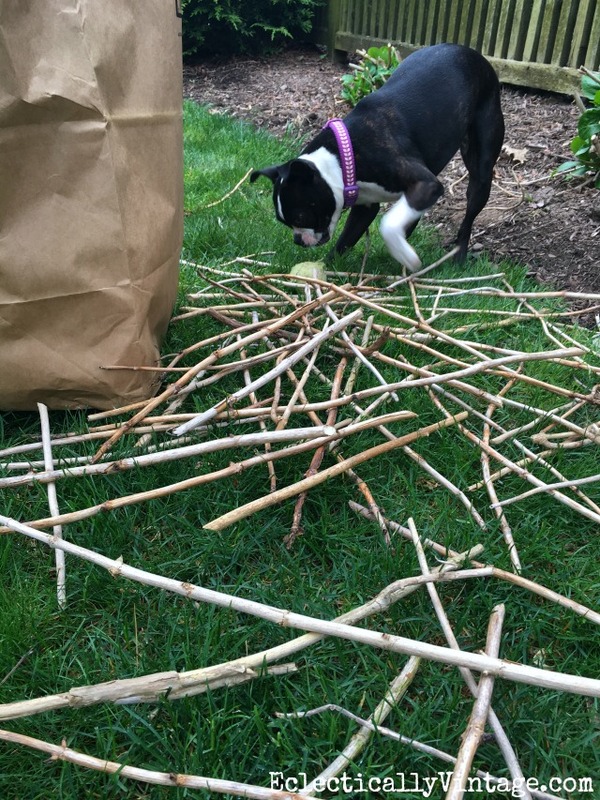 I know – my neighborhood is filled with sticks! I forgot to mention we added HollyTone to our hydrangeas – will add that to the post now! Glad we have our peonies and lilacs to console us Renee! I’ve been stressing over my hydrangeas, mine looks exactly the same! I live in the lowere Hudson Valley & I can’t remember having 80o weather followed by a hard freeze like this. This particular one had the most beautiful pink/purple/blue tones on each flower,my favorite,took yrs. to bloom,now this! I’ve noticed the stems aren’t dead but not budding yet either,I have green leaves coming from the bottom also. I consider Limelight one the work horses of the garden, they’re fine, they put on a show with the color changes & then I dry them & enjoy all winter. Thanks for the info. It’s good to know I’m not the only one struggling with this. The hydrangea struggle is real Judie! Glad we have our Limelights to console us! Two hydrangeas? I know you’ll be planting lots more Diane! Lucky you to have blooms! I love hydrangeas but mine are slow this year too! I need some limelight and peonies! Everyone needs peonies! Mine are ready to burst and I can’t wait to bring them inside! Hi Deborah – we use Preen and keep our dog out of the beds until after a rain or two. Hope that helps and enjoy your Bostons!! Your hydrangea are supposed to look like that. There are two types of hydrangea….those that grow leaves and flowers on old wood and those that grow leaves and flowers from new wood…yours are the later. Just cut back the old wood each spring and you’ll have a beautiful new bush each year. If your hydrangea is the type that grows on old wood you’ll see the leaves sprouting from the branches left from last year…sometimes these are slow in developing. Once you see the leaves sprouting just trim out the dead wood. If you cut back the type that grow on old wood you’ll never get flowers. Always look up the type of hydrangea you purchase to see which of these two varieties you have, that will help you know what to expect and especially how to prune them. Good luck!!! Thanks for chiming in Marilyn. 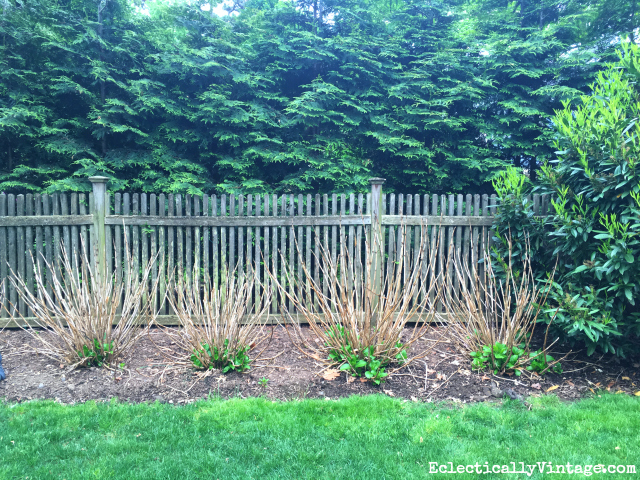 I wrote a whole post on the different hydrangeas – old wood vs. new, and when to prune. 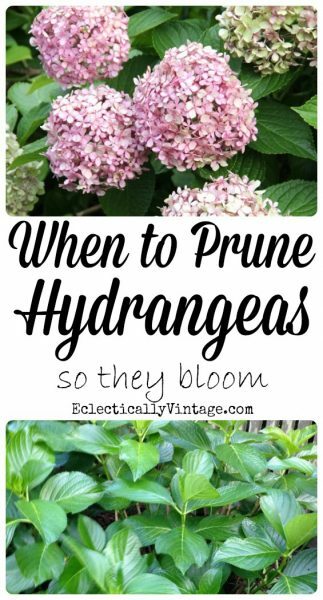 You can read more in that post here: http://eclecticallyvintage.com/2014/07/when-to-prune-hydrangeas/. However this isn’t the case for my hydrangeas this year. This is winter kill and they need to be cut since the buds were killed in a late frost. Was just going to say the same thing. We cut back every spring and they are almost above the bottom of the window now. I have had PeeGee Hydragenas around my deck for 12 years. I have always had gorgeous flowers with healthy blooms. I never did much as far as clean up after the winter. However, Last summer there wasn’t one flower. Not one! so I started fertilizing the plants every other week the rest of the summer. This spring, I cleaned out the dead wood and mulched. Thankfully those gorgeous flowers are back! So glad they came back Alison! Enjoy your PeeGees!! Oh em geee!!!! I feel your pain, on so many levels. I live in Edmonton (zone 4) and have 4 big leaf hydrangeas (zone 7) that i baby all winter. This is year 3 with them and they too looked very similar to your. I just trimmed em back last weekend and my boston terrier did also enjoy all the new chew sticks. I am hopeful and proud that they at least survived where most of my neighbors regular hydrangeas weren’t so lucky. This is my firat year with peonies so i am excited abiut those as well. (Thanks for sharing your experienced green thumb) mine are very new but very green as well. Goodness, I just take the garden shears to them when the flowering has finished and hope for the best! but each year they pay me back by being amazing! I trim right down to the foliage and ignore brown or whatever! And they just love a good feed once in a while! You can also manipulate colour, either blue or pink. Try it, its so cute when your blues turn out pink! I would love to change my hydrangeas color … as soon as they start blooming again Tina!! Do Coffee grounds change the color of the hydrangeas? Here is the formula for color. I get all 3 colors on ours. Must have fun soil here lol. For true blue flowers, the hydrangeas need to be grown in acidic soil (pH 5.5 and lower). For pink flowers, the plants need neutral to alkaline soils (pH 6.5 and higher). For purple blooms (or a mix of blue and pink flowers on the same plant), the pH of the soil must be 5.5 and pH 6.5. I too feel all your pain. I have one at the front of the house that blooms big beautiful purple and pink blooms. The one in the back yard has never done well. I moved it to the front this spring so hopefully it will get better. I have to say I love your beautiful BT. I am a Boston mommy also. They are awesome fur babies. I had to move one that was getting too much sun from the front of my house to the back and it was thriving and huge … until this year! Brown sticks that I cut down – fingers crossed for next year! Here’s to cute Bostons Angela! Add alum sulfate to these guys in the late fall at a high rate. I cut mine down every fall and add the sulfate. I have the biggest blooms and everyone always tells me how nice they look. Yes, I use alum sulfate – can’t wait for mine to bloom again! Mine looked the same but no green leaves anywhere. When I check the roots the look green and healthy. It’s been this way for 3 months. Still hoping for green leaves. If there are no green leaves on the branches soon, I would cut them. At least you won’t have to look at the ugly brown sticks! So glad I found this post. Moved to a new home and I could not understand why the previous owner left the hydrangeas the way she did. I pruned before I read, but ended up doing it correctly. Did not like 3 or 4 tall stalks left with buds so I cut them and stuck them into the ground and so far (3 weeks later) seem to have rooted as leaves growing. Glad your hydrangeas are rooting! Thanks, I have been wondering whether I should cut my canes back. This is exactly how mine look after the weird whether this past winter and early spring. Thank you. I think you just saved my hydrangeas. Question, is there a hope of survival if they are in part sun/part shade? I had to move a hydrangea that was getting way too much sun and now it’s thriving. Just watch yours and see how they do. Ok, will do. Thank you so much. Happy Father Day to the fathers in your life. This is my fourth year for my hydrangea and it has never bloomed. Each spring I cut off the dead sticks the new greenery makes a beautiful plant. This year I left the dead sticks after reading it might bloom on those. I don’t know the name of it. Why has it not bloomed? You can’t prune old wood hydrangeas and expect them to bloom because they bloom on that old wood. Cutting them means it may take years for blooms to happen. Leave them alone and hopefully they bloom – good luck! Your term “winterkill” is a miss-understanding. Hydrangeas are SUPPOSED to go dormant each year and leave the brown sticks. Some folks prune them in fall, but I wait until early spring and start looking for the new green buds. I prune each cane down to where the first bud appears. It is true that some hydrangeas bloom on old wood, and some bloom on new wood. You must know which plant you have. Yes I realize that but this year was an exception because the winter frost killed the buds leaving dead branches that will not bloom. Someone please tell me about pruning Endless Summer hydrangeas. They bloom on BOTH old and new wood. I’m never sure what to prune! I have some hydrangeas that bloom pretty reliably, especially the limelights. I also have 12 lace cap hydrangeas that were professionally planted 5 years ago, & only one of them has ever bloomed at all. I’ve tried everything I can think of. They get adequate sun, water, soil amendments, and fertilization, but nothing except green leaves appear each spring. Is there any hope??? I don’t have any hydrangeas at present but I do like them and hope to plant some later. My comment is for Sushi, I love him/her. Beautiful, had three of the Bostons and I love them, they are so comical. Very active but just a pleasure to have. Sushi sends kisses Leatha – she really is the light of our lives! I don’t hate the sticks! I’m in Minnesota so my hydrangeas look like yours every year. A few years back, I needed to beef up the mulch in my garden and was too overwhelmed as we’d just moved in (the plants were provided by the previous owner!) So, when spring arrived, I chopped all the sticks down and cut them into two inch pieces and left them in the garden. I’ve now converted entirely to the hydrangea sticks for much (only in this garden, though) and it’s working great! My husband (who was the real green thumb in the family) was shocked at how well it’s working. I have beautiful green leaves but only had 3 flowers this year how do I get them to bloom?? I had the same problem – improper pruning and a harsh winter (freeze after buds appear) can be causes. Unfortunately, it can take years to see blooms – I have been flowerless for 2 years! hang in there! I have 6 hydrangea bushes that are 50 years old. We always trim them within 6″ or so from the ground in the spring. The bushes grow so huge and full of hydrangeas as big around as your head! We have people wanting to buy the flowers for weddings or for drying. The bushes also have three colors of flowers, sometimes growing on the same bush! We are amazed at their beauty. We don’t even fertilize them. They grow on the north side of our house. They sound stunning Nancy – enjoy those beauties! I have to laugh or I’ll cry over my lack of hydrangeas! At least my dog was happy! Best advice I’ve found on my flowers! the hydrangea struggle is real Michelle! I’m also in Maryland. For years I had gorgeous blooms on my old wood hydrangea and suddenly they stopped blooming in 2015. I asked a local master gardener who confidently told me that if the temperature dips below zero in the winter for two consecutive years old would hydrangea will not bloom the following summer. Unfortunately I don’t recall what he said about when the blooms will return. I have my fingers crossed for this year. Fingers and toes crossed for you too Amy! 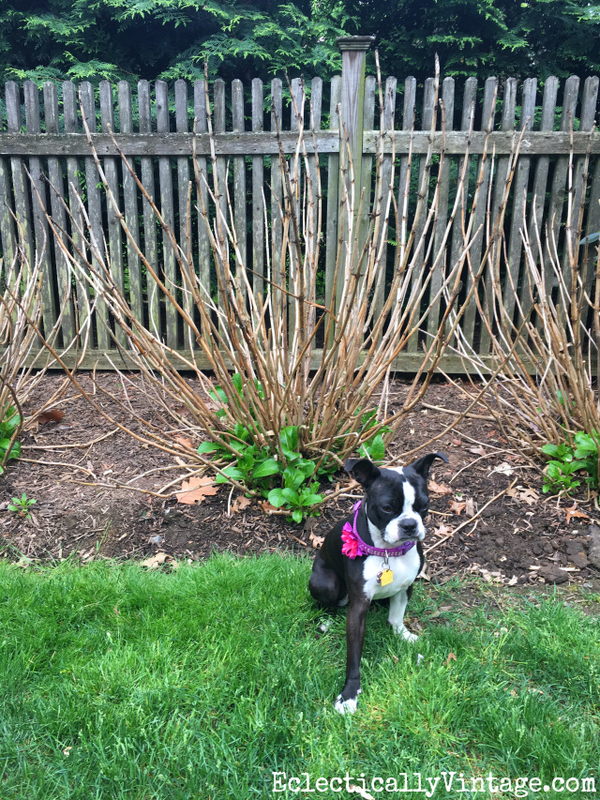 Sure cute Boston Terrier……..I love my Bostons & hydrangea. Here’s to cute Bostons and hydrangeas! There’s nothing unusual about that pic in Kentucky. That’s what perennials do in the winter. You can cut all that dead stuff in the fall, because freezing temps might cause damage to the roots if the stalks are left, I know I always heard that about chrysanthemums. 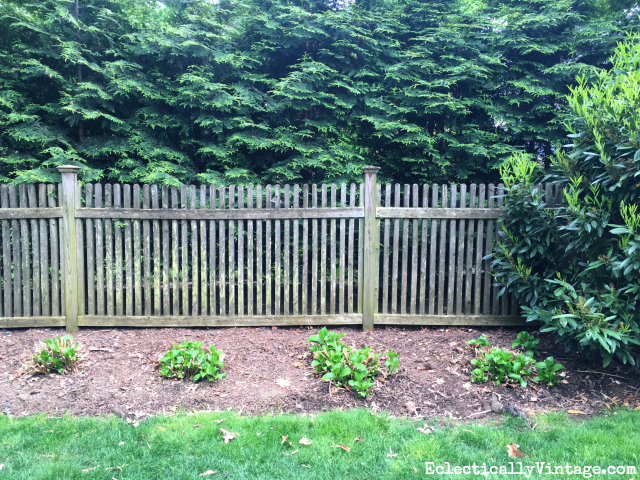 Would please tell me what type are the evergreens are behind your fence? I’ve been looking for this kind for so long. someone told me that the hydrangea swigs are bad for animals is that true? Your dog looks fine. I’m not sure but don’t worry – we didn’t let Sushi eat them! I moved my hydrangeas a couple of years ago and it took them a couple of seasons to bloom again, but they were pretty pitiful last year. Maybe I’ll try your fertilizer. I LOVE hydrangeas! Thanks for all the tips Kelly! Oh Gail I feel your hydrangea-less pain! I literally shed tears one year – I want my hydrangeas back! I don’t know what I love more – hydrangeas or my Sushi!! Ok, Sushi wins! I planted endless summer hydrangeas three years ago. The looked horrible for the first three years. This spring I started adding used coffee grounds to them whenever my husband brewed a batch of cold brew coffee. They took off like crazy. I’m not sure if it’s because it’s the sleep creep leap theory, the coffee grounds or the massive amount of rain we had this winter that did the trick. I also fertilize with a hydrangea fertilizer. Thanks for your blog on how to prune. I think that helped a lot as well. I love endless summers too! I have some and will plant more this spring. You can never have too many hydrangeas! How do your hydrengeas look now? Did they recover? Mine look like this now. They have some buds on the brown stalks so I’m hoping they bloom this year! Yes, Sushi is a Boston and she says hi! Thank you for your advice my hydrangea look exactly like yours and I will most definitely use your tips. Then stand back and await for maybe a bloom or two. Maybe we will get lucky and get two blooms between us! Thank you so much for this post. It’s one of the only helpful ones on pintrest. I think it’s time to cut the canes (May). I was actually liking that they were protecting the new leaves at the bottom from deer. Good luck this year with your hydrangeas! Glad to help Kat and I hope the deer stay away! Why don’t you try putting it in a larger pot with a good quality potting mix until you can put it in the ground. Thank you for this information. For many years I did’ know the appropriate thing to do with dead branches. You have answered many questions. So glad this helped Miranda! Sounds like you had a frost that killed the buds. If you have leafless stalks at this point, I don’t think there is hope that they will bloom. I would cut the dead stalks and you should at least get a nice green bush but probably no flowers this year. Ok thankyou! Such a bummer:( my strawberry vanilla hydrangeas look amazing but they are in a different location. What if some branches are budding on half the branch but not on the top half of the branch, should I cut the dead down to where there are buds or leave those branches? Some of my brown sticks have a little green in the middle then hugely tall brown stock continuing up from there. …suggestions? But hydrangeas are not evergreen. So in certain climates they always look like this in spring. Annabella is another hydrangea that will bloom in spite of a harsh winter. We had 3 summers without blooms on big leaf hydrangeas but this year they are loaded with buds. I am thrilled! So happy for you – I don’t have any buds so I’m not holding out any hope this year! Very cold water, full vase of water. If some wilt, add ice cubes to the water . This is how florists prepare them to last at a wedding. Really works! I love hydrangeas! I have lots of sun in my garden, will the Endless Summer Hydrangeas survive???? My hydrangeas haven’t bloomed in a few years, so thanks for your tips. I will be inspecting them as soon as this rain stops and cutting anything without green life on the cane. I also appreciated the tips on planting Peonies as I got one for Mother’s day and am ready to plant. Enjoy your posts very much, happy gardening to you. Thanks so much Marilou and happy gardening to you! Enjoy those peonies! I live in Florida but grew up in CT. My mom has bought me three hydrangeas and I thee away two as the sticks got brown but I finally got another one and I am praying that it will grow here in our soil and weather. Any tips?! I have not transplanted it from pot yet. The leaves are currently wilting and the plant is half green. Help? 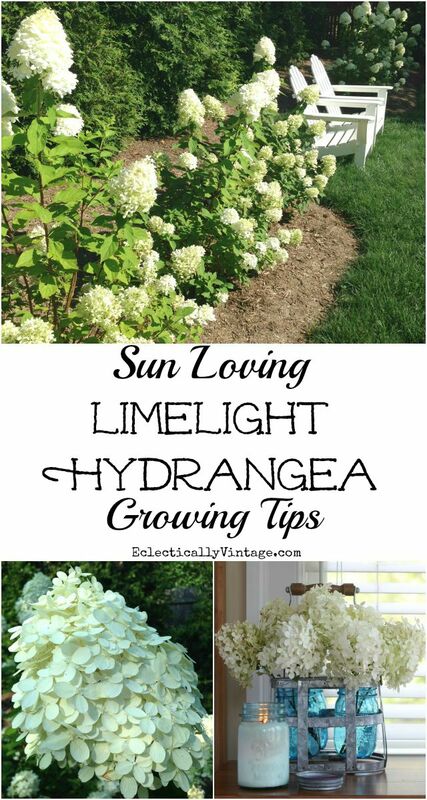 I love hydrangeas and would love to see them as my edging. “Thanks for nothing, Oprah!” ? Thanks for the laugh and the good advice! I cut my hydrangeas down to the ground as soon as all blooms are gone in the fall/winter. I do this every year and now my hydrangeas are so huge they are taking over my flower beds. If I want to have a different color bloom then last year I peel several oranges and bury them around the root of the hydrangeas. Be sure to bury them deep around your plant. Lucky you to have such fabulous hydrangeas Linda! I live in a different region; (Florida) but, I always wait until the last frost before I prune my hydrangeas; making sure I look for spikes/stems, that are dark brown and dry to the touch before pruning. I do have couple that I believe I planted too close to other shrubs, that don’t get as large as my more matured hydrangea. I waited to long if I haven;t transplanted them before the end of May; I don’t know? You can probably move it just make sure to give it plenty of water and attention or you can wait until it cools off in the fall. In the past years my Hydrangeas have gotten brown spots on the leaves. How can I prevent this? How do I winterize my hydrangeas? My hydrangea looked liked that every year. It never bloomed and always came back like a perennial. It was not a hydrangea for my zone. I live in Michigan. In our area gardeners should plant peniculta and arborscens. I was told by a woman associated with Proven Winners that winter doesn’t kill the buds formed in fall; spring frost does. Hydrangeas are my favorite ,i love them. My are blue, but only one is blooming ,their sticks have some brown spots I am very sad.could you hel me plaease! Thanks for attempting to tell me how to fix my problem with my Hydrangeas not blooming. Unfortunately, I haven’t learned why they won’t bloom or how to fix the problem. For 15 years we’ve left the old wood and still no blooms. We’ve checked but not Bud’s and no green, no black, nothing. Your two stories have great links but have failed to leave me with answers!!! Maybe they are getting too much sun or not enough sun? Good luck! You can give wrapping a try Charla. I have so many hydrangeas that it would take me forever to wrap them so I’ll just leave it to mother nature and hope for the best. I have this happen with butterfly bushes as well. Spring frosts wreak havoc on our flowers! Hello from Alabama! We are all having the same problems with our Hydrangeas, here in the South East Region, due to spring frosts. It really takes away from the gardens, and is a stab in the heart to any Hydrangea lover! I have a problem of a different sort, that I’m hoping someone can enlightened me on. Two yrs. ago, one of my older Endless Summer plants, changed to blooming Lace Cap. (very few blooms both yrs.) WHY? I’ve never heard of that Toni – I would try your local garden center to see if they can help. I have Kaleidescope hydrangeas I bought from a mail order company a long time ago. They have only bloomed twice since I got them. Very frustrating. I am about ready to dig them up and trash them. I have moved the plants a couple times thinking that would help but nothing seems to work. I have a large flower garden with many other flowers that I have no problems with growing. I came across your webpage and my hydrangeas looked like the ones in the “winter kill ” photo in the spring. I have not pruned the dead sticks because I thought that is where the new flowers would grow. Still no flowers but plenty of new growth and green leaves but no flowers. So do you cover the Hydrangea sticks in the winter so they do not freeze the new buds early in the spring? Thank you for your input. I just signed up for your newsletter. I have 2 hydrangeas that look just like your winter killed ones. The old dead stems are still there and I cut them after the new growth begins from the roots. They have not bloomed in 4 years although they were blooming when I put them out. The blooms just tapered off until there was only 1 and then nothing. Do you have a suggestion? Thanks. I was in the same situation last summer. Live in Maine, and harsh winters have kept my hydrangea’s from blooming the last 2 years. I think I got one blossom last summer. 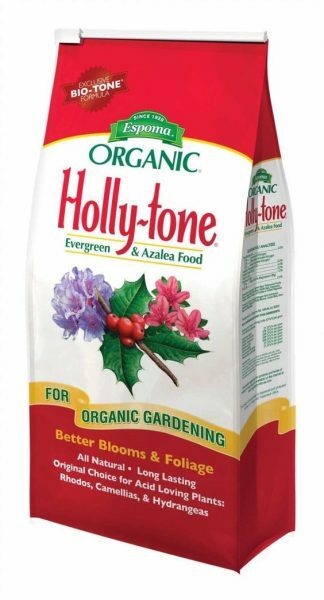 Anyway, I will be using your tips and suggestions, especially changing my fertilizer to Holly Tone. I do use it on other plants but never thought to use it on the hydrangea’s. Thanx again for sharing your good advice and knowledge!! Much appreciated by a fellow gardener. Wishing you a mild rest of the winter and a full blooming gorgeous display of flowers this coming season!!! I cut my canes, after first frost, down to about five inches from ground. I have the same type as you do. In the spring they shoot up on new canes and have huge, dark green, leaves. My flowers do not bloom until September and the blooms are dinner plate size. None of my friends, nor the local nurseries, have blooms this size. The other advantage is that my blooms do not get sun burned as the normal heat waves are over by then. They also dry beautifully! Then my husband killed them by cutting them back in the spring. This was a huge plant and it never grew again. 🙁 I waited for years and then finally gave up the ghost. You were lucky that yours came back. I was lucky – and I’ll be luckier when I get more than 3 blooms!! Hopefully, this is my year! It appears my dog ate all my hydrangea buds. They were so small I didn’t notice until now. Will I get any blooms this year? Oh no! Naughty dog :)! It depends on what kind of hydrangeas you have (old wood vs. new wood). But if they were budding, I doubt you will get blooms. Cut them to the ground late fall/winter.They will come back full and beautiful in spring.Mulch around plant. Cut my hydrangea shrub to the ground last fall and don’t see any new growth coming out of it this year no green . Did you have a late spring frost? Mine are just starting to turn green so it may just be late. My daughter bought me a beautiful full bush last year for mother’s day. It barely survived the winter and all stems are dead. I only have 2 little shoots coming from under ground and I am guarding them like their my kids. We had such a terrible winter with -20 degree temps that lasted days and days. I do hope my little shoots survive. I will certainly make sure I give them better winter protection this year. My hydrangeas are in the same boat – fingers crossed for us! Thanks so much for the tips on Hydrangea care. I planted my first one last year and when starting to clean up my garden this year I was scared to death thinking I had lost my Hydrangeas. But, they are really looking great now and, thanks to you and your tips I know exactly what to do. Thank you again. 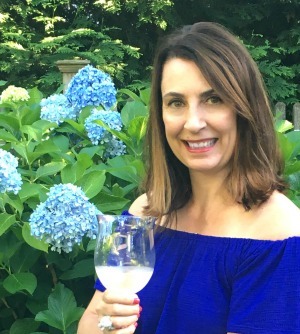 I’m so glad Tracy – enjoy those hydrangeas! Thanks for this post! I to have mile high sticks with just teeny but bold green leaves on the bottom. Last night I said what the heck and trimmed back all wood that had zero green on it. Fingers crossed they can come back! I’m crossing my fingers for you too Christy! Honey, there’s way, WAY too many ads to make this worthwhile. I hated these blue flowers at first, they looked unnatural. My wife wanted them 20 years ago. Now we’re surrounded with them, I’m a convert. I grow the old ones that don’t look like they’re on steroids. We live on the foggy coast in RI. First – put the pruners away. They want to sprawl. The old canes that lie on the ground sprout new shoots which revive your stand as the years go on, and give you more plants to spread out or give to friends. (Drop a brick on some to accelerate the process) The old canes that no longer shoot green buds also provide a framework for the flower heads years later, so there will no longer be floppy heads on the ground. Finally, the old canes that are dead still provide winter shelter for the live canes in their lee. Yes, they do, there will be flower buds even after a tough winter on the leeward side of the plant. So put the pruners away. There will be years when many buds are lost, but there is always next year, and by now your patch has expanded so you have more canes to fall back on. Never mind the straight lines. Just plant the tender ones out of the winter wind, put them all where they will be shaded from late day sun so the blooms don’t dry out (once they do they lose their color), and let the fall leaves accumulate around them when the summer is over. Throw some hay in there the first few winters to build up your soil and protect them when they’re small. Feed with compost or perhaps some blood meal if they need it. As they get happy, let the ferns and asters and tall grasses grow up among them. As they sprawl, lose the lawn edges, and let this edge of nature take over your lawn. Very felpful artical. My Boston,Reilly, drags the dead canes all over the yard. LOL – Sushi and Reilly need a play date! I’ve outlined everything in the post. If you have brown branches and no buds or blooms this late in the season, you won’t be getting any unfortunately. You can either leave them or cut them down. I’m not sure about your other hydrangea. I have beautiful growth hydrangeas but they never flower. They are in a southrn exposure area and grow magnificently but sadly never flower, what is the problem here? I had the same thing to happen to me, I have lots of leaves but no blooms. So when it is ready for winter I should cut back? I miss my blooms they where so pretty last year. The problem was spring frost. You can definitely cut back the dead canes and hope for no frost next spring. Fingers crossed for you! I have always waited until my hydrangea is completely leafed out before I do any trimming in the spring. I learned that when I went to the flower and garden show in Chicago and asked one of their master gardeners. Then I only trim the branches with no leaves or buds. Works every year!! Yep – snip off the dead branches but never the ones with green leaves or blooms! I love Hydrangeas and I am having difficulty getting them to blume. They have been in the ground for at least 3 years. What can I do? We seem to have the same taste in flowers as I also love hydrangeas and peonies. I have another hydrangeas named ruby slippers that I just adore. The buds start out white and turn red so by fall you still have color in the garden. I started several years ago with peonies which I live in the spring and early summer then the hydrangeas start blooming to set the tone for the rest of the summer. Thank you for your post I know I will enjoy reading your future ones! The two best flowers in the garden! Your ruby slippers sound gorgeous – enjoy them! This is exactly what happened to mine this past spring and I cut them just like this showed. They grew full of leaves after that but I got only two flowers in the deep center in early summer which I assume was from the few green leaves that survived the frost. Now they are huge and it is August. What do I do now? I live in South Carolina. I bought this house with them already planted and do not know what kind they are. I have never pruned them (until the killing frost) because I was afraid I would loose a year of blooms. They are on the verge of being to big for their location. Your dog is so cute posing by the hydrangeas. Thanks for the info. I would like to know if you can only do this in the spring or if you can do this trimming in the fall as well? And when do you fertilize spring, summer, fall, or all three times? Great Article… I plan on planting my babies in a pot.. One for each color…. I can feel your pain mine look just like yours. I’ll try your suggestions and post a picture of pain also. There is hope Elvira – we just need patience to see those hydrangeas bloom! Im confused. So when the fal arrives, do I cut all the branches down? My hydrangea plant looks like your stick version every year. I do no pruning. I thought it was supposed to look that way. I only get 4/5 flowers a season. You can prune in fall but you don’t have to! You may not be getting flowers for reasons I explained such as a spring frost or not enough/too much sun. I’m confused. I’m not sure if I have old wood or winter kill. My husband pruned my hydrangeas over a year ago and they didn’t bloom last year. Should I prune them or not?